This photo was taken in the early morning hours at the Caribbean Beach Resort in September of 2009. The lake was smooth as glass allowing me to get this "mirror image" shot. The Caribbean Beach is a very large, moderate class resort with a tropical theme. It is located right around the corner from Epcot. This picture was taken at Epcot on our trip in July. It is in the computer room scene during the ascent portion of Spaceship Earth. The detail that Disney puts into the audio animatronic figures is amazing. This guy looks pretty darn real! I was recently introduced to an interesting Disney collectible that I never knew existed. 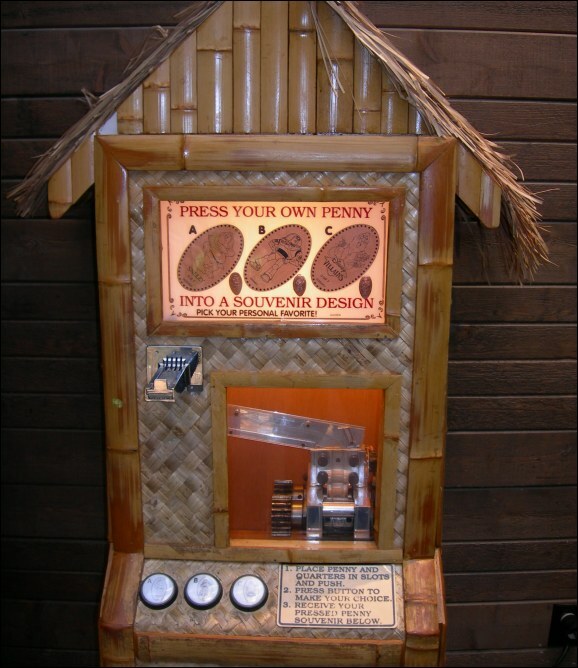 Most of us have seen pressed penny machines in the past. They can be found in grocery stores, shopping malls, hotels, etc. You can also find these contraptions in Walt Disney World. I have seen them here and there, but never realized the scope of what Disney has to offer. There are close to 200 machines located all around the Florida property. 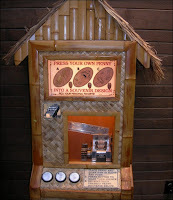 A directory of pressed coin machines and catalog of the various designs can be found at Presscoins.com, the unofficial Walt Disney World pressed coin guide. For those of you that don't have a clue what I'm talking about when I say "pressed penny" or "pressed coin," I'll elaborate. A pressed coin is created when a coin is squeezed between two rollers. One of these rollers has an engraving on its surface which makes an imprinted design on one side of the coin. In the case of the Walt Disney World machines, the designs are typically Disney characters or attractions. They have been primarily electrically powered, but many of the new machines have hand cranks. 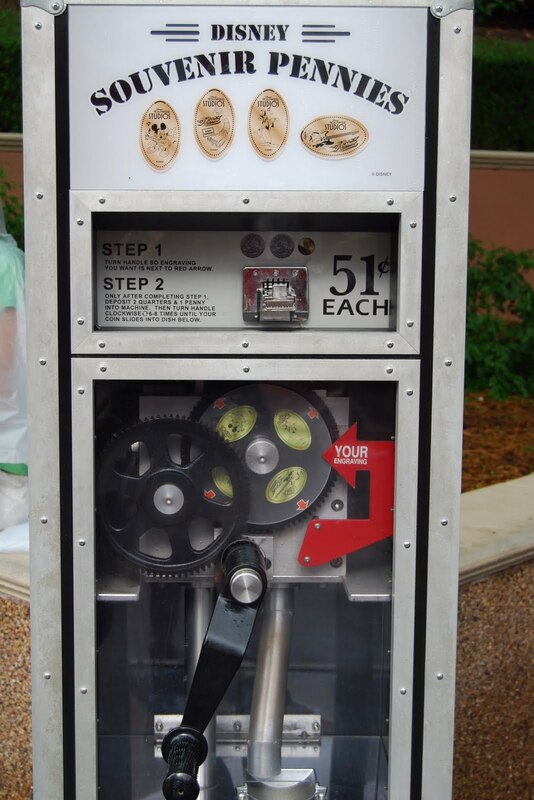 The Walt Disney World pressed coin machines started appearing back in 1994 and have continued to grow in number ever since. Most of them contain pennies, but there are some that press quarters and a few that do dimes. You can find roughly 25 or so machines in each of the 4 theme parks, as well as 17 in Downtown Disney and 66 in the resort hotels. Each one contains up to 4 different designs. The cost to have a coin pressed is only 50 cents, plus the value of the actual coin. Over the years, pressed coin collecting has apparently become quite a hobby. You can even purchase Disney pressed coin collection books to store them in. 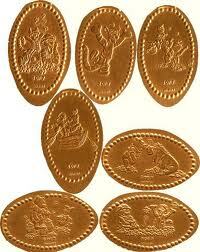 These coins also make great souvenirs for the kids. For only 51 cents a piece, you have unique and inexpensive trinkets from your favorite spots in Walt Disney World. On our last trip I spent $20 on a toy that my son found at the Magic Kingdom. The same $20 could get close to 40 pressed coins which can be picked out over an entire vacation. From what I hear, part of the fun of this experience is actually spotting the machines in different places. For a complete list of current coin machines, and their locations around Disney World, you can visit Presscoins.com. You can also find the specific pressed coin designs on the website. Finally, Presscoins.com even has lists of previous coins as well as special celebration coins. In all of my many visits to Walt Disney World, I never payed much attention to the pressed coin phenomena. However, I am looking forward to my next trip and introducing our son to the experience. I know he will enjoy finding the different machines and starting a collection. For a five year old, he is pretty savvy (or should I say he's a con artist) when it comes to gift shops and souvenirs. If nothing else, the pressed coin idea will let him get "lots" of souvenirs without burning a whole in my wallet! This is another photo from our December, 2008 trip. This is what Epcot looks like from about 3,000 feet. We were flying a 2007 Cirrus SR22 airplane, and I took the pictures from the front right seat. My co-pilot on this flight was Bobby Bonilla, the retired MLB All-Star. It was alot of fun combining a training flight with aerial photos of Walt Disney World. This picture of the main pool at Disney's Old Key West Resort was taken on our trip in April of 2010. Old Key West was the first Disney Vacation Club (DVC) resort, built in 1991. It is a classy, condominium style property with alot to offer. Check out the Mickey ears at the opening of the sand castle water slide! This photo of the monorail in the Contemporary was taken in April of 2010. The concept of a futuristic train traveling right through a resort hotel has amazed me since I was a kid. This is one of the things that makes Walt Disney World so unique. There is no other place that you can take a picture like this one! This photo was taken in March of 2008, on our anniversary trip. The Jammitors are a very entertaining trio of percussionists who perform on trash cans in Epcot. They casually walk out looking like sanitation cast members and before you know it they are "jammin" away for the guests in future world. They usually set up near one of the Innoventions breezeways which greatly amplifies their sound. The next time you are at Epcot, be sure to keep an ear out for the Jammitors! This photo was taken in March of 2006. It is in the queue of Expedition Everest in the Animal Kingdom. It is another great example of the amazing details that go into so many of the attractions. Disney Imagineers actually did scientific and cultural research in remote areas of the Himalayas while they were designing this ride. They collected genuine artifacts from all over Nepal that adorn this incredible queue. There are certainly ways to bypass the normal queue for Everest by getting a Fast Pass or hopping in the "single-rider" line, however everyone who visits this attraction should go through the standby queue at least once. It is a big part of what makes Expedition Everest so great and should not be overlooked. Today we celebrate the 10th anniversary of an important, yet often overlooked attraction in Hollywood Studios. Walt Disney: One Man's Dream officially opened on September 23, 2001. Up until this point, there had been very little in the parks about the man who started it all. Of course there are references, pictures, and even a statue of Walt, but One Man's Dream was the first attraction completely dedicated to the life and dreams of Disney himself. Prior to the opening of Walt Disney: One Man's Dream, most guests didn't know much about Walt, other than he created Mickey Mouse and was the inspiration behind the Disney theme parks. This attraction introduces new generations to the power of the ideas that came from this truly amazing figure in American history. It is really a nice mixture of a museum and a tribute. This self guided walking tour starts with the birth of Walt on December 5th, 1901 in Chicago, Illinois. It continues in a chronological fashion through his boyhood in Marceline, Missouri, his beginnings in the film industry, and finally into the design and creation of the theme parks. At the end of the walking tour, guests have the opportunity to enter the "Walt Disney Theater" to watch a 15 minute film about Walt. This film reveals the many hardships he overcame as well as previously unseen footage, including Walt talking about Mickey Mouse. One Man's Dream has an incredible amount of memorabilia. In fact, this collection of over 400 items was flown in from California on a FedEx Airbus A300. For this flight, the plane was designated the "Spirit of Imagination." Many of these priceless artifacts had never been seen before publicly. There is really too much to describe here in one article, but I'd like to mention some of the notable pieces. 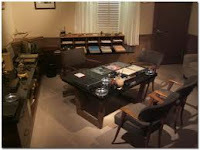 There is a re-creation of Walt's office, complete with his actual chair, desk and cabinet. You can also see his animation camera stand where he created "Steamboat Willie" and "Plane Crazy." There are several Oscars, including the one for "Snow White and the Seven Dwarfs." Another neat piece of furniture to be seen here is Walt's school desk with his initials carved into it. You will also find many of the original models for some of the theme park attractions including Peter Pan's Flight and Sleeping Beauty Castle from Disneyland. A recent and extremely significant addition is the original Abe Lincoln Audio Animatronic that debuted at the 1964 New York World's fair. 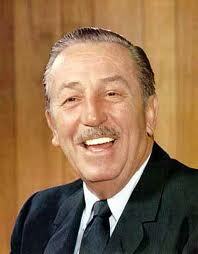 Walt Disney: One Man's Dream is an attraction that should be experienced by every Walt Disney World guest. I think that often times people mistakenly bypass it when they hear that it isn't a "ride" or a "live show." I feel that it is an important and necessary journey that explores the life of a man who was such a giant in the entertainment industry and who's work is still revered throughout the world. The attraction can be walked through in as little as 15 minutes, however you can easily spend over an hour enjoying all of the individual pieces that are on display. Each time I visit, I seem to find something new that I hadn't noticed before. Also, although it's not required, every guest should watch the film at the end of the tour. It is really a moving tribute to Walt Disney, a man who has directly and indirectly brought so much happiness to millions of people for nearly a century. This photo was taken in January of this year of the waterfall right next to the Journey Into Imagination attraction in Epcot. If you look closely, you will notice that this is an "upside down" waterfall and the water is actually flowing up. If you walk behind the waterfall near the entrance to Captain EO, you will find the dancing water. These streams of water appear to jump from spot to spot while guests (usually young kids) tend to reach up and touch the water as it goes flying by. This entertains most people walking by, other than the parents of the now soaked kid! This photo of the Enchanted Tiki Room (Under New Management) was taken from the top of the Swiss Family Treehouse in Adventureland, at 5:55 pm on January 12th of this year. The reason why the time and date are significant is that The Enchanted Tiki Room had a small fire at 5:30 that same night that shut down the attraction for nearly 7 months. I didn't learn about the fire until several days later, and the fact that I took this picture when it was probably still smoldering is pure coincidence. When the attraction reopened on August 15th, the "Under New Management" version was removed in favor of a show that is very similar to the original Tropical Serenade, which opened with the park in 1971. This picture was taken in March of 2006. The Polynesian Resort is a great place to relax while on a Disney vacation. I love lying in a hammock under the palm trees while enjoying a breeze off the Seven Seas Lagoon. There is also a nice view of the Grand Floridian Resort in the distance. This picture was taken at the Seas With Nemo & Friends back in January of 2010. Prior to 2006, the pavilion was called The Living Seas﻿ and had a more educational theme. Although there is still an educational element, the Nemo overlay added more "kid inviting" entertainment, including the ability to get your picture taken inside the mouth of Bruce the shark! I have been so blessed to have had the opportunity to visit Walt Disney World dozens of times in my life. My parents always made spending time together as a family the highest of priorities. There really is no better way to enjoy quality time together than on a Disney vacation. Now that I have a family of my own, it has been my greatest joy to spend time with my wife and little boy at the vacation kingdom, making memories of our own. Unfortunately, there are many kids who dream of going to Walt Disney World who won't get that opportunity. Today, I would like to join forces with an organization that helps seriously ill children fullfill their Disney dreams. Anyone who spends any time in the Disney online fan community certainly knows the name Lou Mongello. I have mentioned him in many of the articles I have written since the beginning of this blog. Among other things, Lou is the host of the WDW Radio Show podcast, author of The Walt Disney World Trivia Books, and publisher of Celebrations Magazine. I have a great deal of respect and admiration for Lou's work, and he helped inspire me to start Digital Disney World. In addition to his tireless dedication to keeping us connected to the place we all love, he also created a wonderful charity called the Dream Team Project. The Dream Team Project was born several years ago, out of Lou's personal experience of taking his dad for cancer treatments at Sloan-Kettering Cancer Center in New York City. While at the hospital, Lou was saddened to see so many children dealing with such a difficult disease. Although donations to cancer research are necessary and relevant, Lou wanted to do something to help someone today. His feeling is that by granting their wish to go to Walt Disney World, we can help make a child's life a bit brighter, if even for just a few days. The hope is that these children can forget about the pain and fear of their medical treatments while spending some quality time with their families in one of the happiest places on earth. Lou teamed up with the Make-A-Wish Foundation and is making these dreams come true for many children. The Dream Team Project has raised over $100,000 to date and continues to help grant these amazingly worthwhile wishes. I feel so fortunate to have a happy and healthy little boy who loves going to Walt Disney World. The incredible work of Lou Mongello and the Dream Team Project has moved me to help make a difference in the lives of children who are less fortunate. Starting right now, I will be accepting donations through my website that will go directly to this fantastic charity. I am happy to be sticking with the theme of "staying connected to Disney World using modern technology." In this case, we will be using the technology for a worthy cause. Every dollar donated will help a child and their family create Disney memories that will last forever. You will see that I have removed all ads from my blog to make room for the Dream Team Project "Donate" section in the upper right corner of the site. All donations are made through PayPal which accepts all major credit cards. I know that times are tough, but if you enjoy Digital Disney World and believe that helping seriously ill children experience the magic is a worthwhile cause, I ask that you donate whatever you can. Every little bit will help! This is my first venture into online fundraising, so I don't really know what to expect. 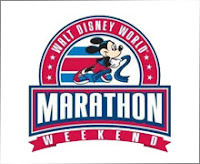 However, I have committed to running the 5K race during Walt Disney World Marathon Weekend in January. I would like to raise "$500 for the 5K" and hope to present Lou with a check for that amount after the race. I have never run a 5K or any other race for that matter. I historically haven't made a habit of running unless I was being chased. However, I feel that this is for a great cause and I have started training diligently for the event. I actually discovered that I enjoy running. Who knew? I'm hoping to do the half-marathon in 2013, but I'm going to take it one step at a time......literally! I want to thank you in advance for any amount that you may be able to donate. I am going to start the ball rolling by donating $40 in honor of Walt Disney World's upcoming 40th anniversary. We have over three months before Marathon Weekend, so if the site could average just $4 per day, we will hit our goal of $500. Thanks again for your help, and I hope you continue to enjoy Digital Disney World! This picture of the Tower of Terror lobby was taken in January of this year. This attraction is one of the best for several reasons. Of course there is the thrill of an out of control elevator and amazing special effects. However, my favorite aspect of the Tower of Terror are the incredible details that are prevalent throughout the entire experience. If you look closely at this photo you will see cob webs and dust everywhere. These elements are intentional and go along with the story of the attraction. In my previous career as a pilot, I had the good fortune of getting a birds eye view of the world. On a trip to Walt Disney World in December of 2008, I did an aerial photo flight all around the property. Although the current regulations (since 9/11/01) don't allow planes to fly lower than 3,000 feet around Disney World, I still got some pretty nice shots. For this photo we were flying directly over Seven Seas Lagoon and had a nice angle right down Main Street, USA in the Magic Kingdom. You can also see some backstage areas in the top right of this picture, including the monorail maintenance building. I will feature several more aerial photos from this flight in future postings. This photo was taken on our latest trip in July of this year. We decided to visit the All-Star Movies Resort for dinner one night. As you might have guessed, this shot was taken in the Toy Story section. You can judge the size of Woody by looking at our 3 1/2 foot tall son in the foreground. You can also see that he is wearing a Cars tee shirt, so Pixar is well represented in this picture! This photo of Cinderella Castle was taken in March 2006, during the "Happiest Celebration on Earth." It was uniquely decorated to celebrate the 50th anniversary of Disneyland. If you look closely, you will see characters adorning several of the spires. The large framed mirror in the center of the castle changed images every 40 seconds to feature each Disney castle and the date its park opened. One of the wonderful things about "blogging" is that anyone who is a little computer savvy can share their thoughts with the world via the internet. It has been a great tool for many of us Walt Disney World fans to write about the place we love. However, most of us don't live near a Disney park, certainly don't work for the company, and in most cases don't have any professional writing experience. Disney Shawn is different. Shawn Slater, known as Disney Shawn in the online community, is a communications manager for the Walt Disney Company and lives in the Orlando area. He has also done stints as a professional writer for Walt Disney Entertainment as well as Walt Disney Imagineering. Like many of us, Shawn has a passion for the Disney parks and he decided to turn this passion (and talent for writing) into one of the best blogs I have come across, DisneyShawn.blogspot.com. Since the blog started in March of 2009, Shawn has published over 650 articles! This is an impressive amount of material in just over two years, however its the quality that is truly amazing. Shawn focuses primarily on writing about the attractions that are found in the Disney parks throughout the world. He doesn't focus on the basic stuff that can easily be found on commerical websites and in guide books. What you will find at DisneyShawn.blogspot.com are the incredible details that most guests never hear about or see. He discusses the history, backstory, and overlooked features of each attraction. His articles aren't limited to the attractions, as he also writes about different areas or lands in the parks, as well as the resorts. In addition to the interesting content, every posting on DisneyShawn.blogspot.com includes high quality photos. 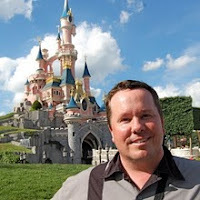 Although my interest lies primarily in Walt Disney World, Shawn does a good job of covering the other Disney destinations as well, particularly Disneyland and Disneyland Paris. As someone who has only visited the Florida parks, it is fun to read the comparisons with the others. It is especially nice to see the great photos from the other locations. At the very least, Shawn has helped to increase my desire to eventually get to every Disney theme park. DisneyShawn.blogspot.com is a must read for every serious Walt Disney World fan. Whether you are interested in the history behind the attractions or would just like to learn about the hidden details, I highly recommend that you check out Shawn's work. It didn't take long for me to add this great blog to my favorites list! This picture was taken in May of 2008 on the Tomorrowland Speedway. Our little guy was still four months shy of his second birthday, but he was encouraged to drive since dad could reach the gas pedal for him! This is just another example of how Disney always makes kids feel important. On our most recent trip in July, our son was actually able to reach the gas pedal with very little assistance from me. However, he still couldn't really see over the steering wheel, which made for a pretty interesting experience. Even at only seven miles per hour, this ride can get a little scary when the pint sized driver is "blindly" flooring it! This picture was taken back in September of 2009. It is looking down Main Street USA in the Magic Kingdom. I was standing right in front of Cinderella's Castle when I took this shot. With "Mickey's Not So Scary Halloween Party" starting this week, I thought it would be fun to post a photo with the Halloween decorations in it! This picture of Spaceship Earth was taken back in January of 2010. The sun was just beginning to set and I can remember thinking how majestic the iconic symbol of Epcot looked at this particular moment. I shot this unique picture of Downtown Disney in January of 2010. It was taken aboard the "Characters in Flight" balloon ride. This giant tethered ballon takes guests 400 into the sky and gives us incredible views of the Walt Disney World property. In the foreground of this shot, you will see a large portion of Pleasure Island. The white building on the bottom left was the Rock and Roll Beach Club which was actually demolished earlier this year. I have fun memories of spending many a night there back in my college days. You can also see the Downtown Disney Marketplace and several hotels in the background of this photo. Today we celebrate the 25th anniversary of the original opening of Captain EO, the revolutionary 3-D film starring Michael Jackson. It was located in the Imagination pavilion on the west side of Epcot's Future World from 1986 until 1994. The attraction returned to Epcot as a tribute to Michael in 2010, where it continues to play today. Captain EO is an exciting, 17 minute, sci-fi motion picture that was cutting edge back in 1986. It is considered to be one of the very first "4-D" films as it features in-theater effects such as lasers and smoke. In addition to the great visual effects, there were two original Michael Jackson songs that made their debut in the movie. The film cost an estimated $30 million dollars to produce. At the time, it was the most expensive film ever made on a per-minute basis. You can bet that alot of that went to paying Michael! Although Captain EO was cutting edge for the mid 1980s, it pales in comparison to the technology that is available today. People experiencing the attraction for the first time, after last year's comeback, tend to think it looks a little dated and even humorous. However, most of us who enjoyed it on its first run really liked seeing it return. From the nostalgic point of view, it brings back alot of memories of a time when big hair and moonwalking were in style. Although the visuals in the film are reminiscent of those seen on MTV during the Reagan era, the Michael Jackson music is timeless and still loved by millions around the world. After his passing, there seems to have been a resurgence in Michael Jackson's popularity. The 2009 documentary film "This Is It," featured great interviews and rehearsal footage leading up to what was going to be his last tour. This movie introduced a new generation, including our 4 year old son, to Michael Jackson's music and talent. When we visited Epcot back in January, not only did my little guy recognize Michael but he also really enjoyed Captain EO. The show is a little intense for some youngsters, but most find it very entertaining. 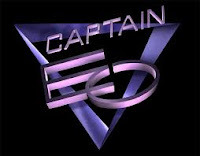 I certainly recommend heading over to the Imagination pavilion to check out Captain EO the next time you are in Epcot. There is no telling how long the show will remain there this time around. If you are a fan of Michael Jackson or just grew up in the 80s, it is an absolute must see! On this 10th anniversary of 9/11, I thought it would be appropriate to feature a little patriotism. I took this picture on our most recent trip in July. 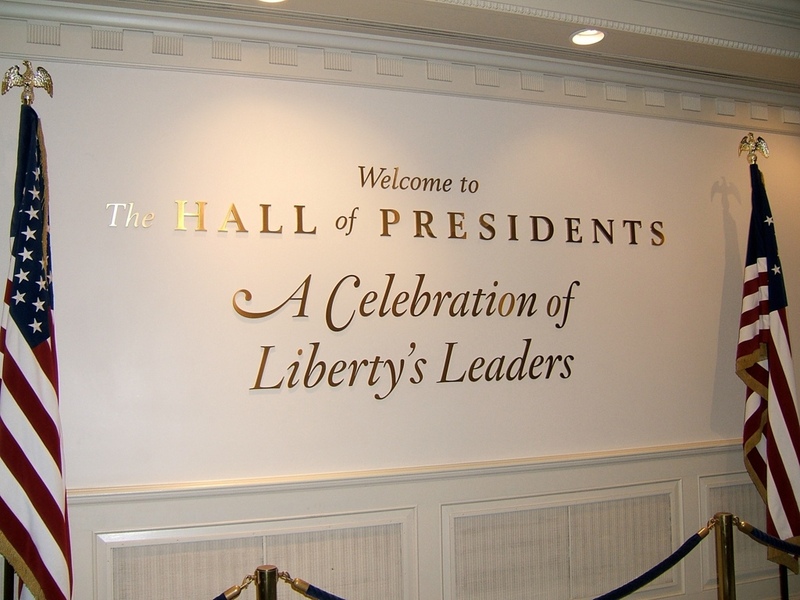 The Hall of Presidents opened with the Magic Kingdom on October 1st, 1971. It is an amazing tribute to the leaders of our country, and it includes extremely lifelike audio animatronic figures of every President. This photo was taken back in 2001 of a float in the now extinct Tapestry of Nations parade at Epcot. 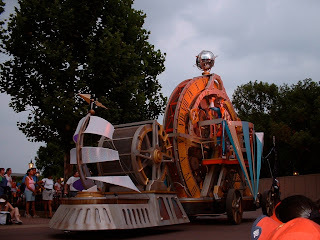 This was an amazing parade that took place each day around the World Showcase Lagoon. It debuted on October 1st, 1999 and its name changed to Tapestry of Dreams late in 2001. The theme of the parade was "unity" and it ran until March of 2003. This picture was taken in April of 2010 at the Richard Petty Driving Experience. This is the car I rode in at the Walt Disney World Speedway, located right next to the Magic Kingdom parking lot. It was an exhilarating experience doing three laps around the track at nearly 140 mph. This is just another example of the wide variety of fun things to do on a Walt Disney World vacation! I started Digital Disney World for one reason, to help us stay connected to the Vacation Kingdom using modern technology. There are so many ways we can do this, which I continue to write about in the articles on this site. However, I have recently discovered a way to literally "stay connected" to the sights and sounds of Walt Disney World, and I'm very excited to share it with you. As I write this article, I am watching Illuminations from the Boardwalk Resort. Well, I'm actually sitting in my office in CT watching my favorite Disney fireworks show on my computer. You are probably thinking, "What is the big deal? There are dozens of recordings of Illuminations on YouTube!" However, I am NOT watching a recording. It is actually 9:15 pm and I am enjoying the finale of this spectacular show as it streams live into my home from the balcony of a room at the Boardwalk. If this isn't "staying connected" to Disney World, I don't know what is! I hope that at this point, you are wondering how this is happening and hoping you can do it yourself. Well, I have great news. This technology is available to all of you over at EyesOnEars.com. It is an amazing website that was set up to stream live video (and audio) from Disney parks and resorts. The video comes from members of the site who are on vacation, and are kind enough to set up their "web cams" so that we can enjoy a live broadcast of the resort no matter where we are. In chatting with some members on the site, I learned that it has been around for over two years. I can't believe I hadn't found it sooner! EyesOnEars.com has a lot of great features. First and foremost are the live streaming videos. At any given time, you can find several live webcams from different areas around Walt Disney World. Typically, they will be set up on a member's hotel balcony, and you will see the view and hear the sounds that they do. They really make you feel like you are there too! In addition to these "static" cams, they occasionally have mobile webcams that will take you into a park. There is also a calendar that shows when and where you can expect to see live footage. In addition to the live footage, you will also find previously recorded videos as well as a pretty extensive photo gallery. 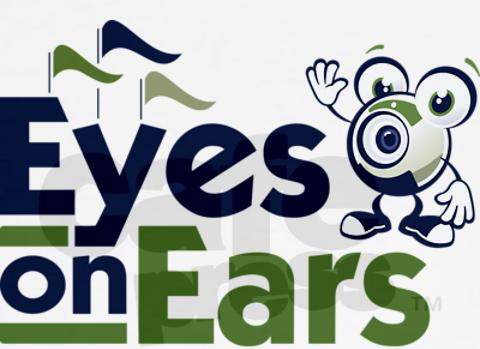 Like most good Disney fan sites, EyesOnEars.com includes a list of forums where members can ask questions and write about all things Disney. Also, while you are watching a video feed, you have the option of joining a chat room where you can interact live with other enthusiasts. The people there seem very friendly and certainly share our passion for Walt Disney World. I highly recommend checking out EyesOnEars.com. I just can't think of a better way to experience this place we all love when hopping on a plane is not an option. I know I am going to be a frequent "virtual" visitor! This picture was taken in January of this year at the Walt Disney: One Man's Dream pavilion in Hollywood Studios. It is the original Abraham Lincoln audio-animatronic figure that debuted at the 1964 New York World's Fair. At the fair, this amazing and revolutionary "robot" was the star of Great Moments with Mr. Lincoln, which was located in the Illinois pavilion. It was so lifelike that many people thought it was a human actor. 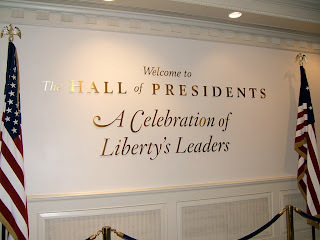 A similar figure can be seen today in The Hall of Presidents over in the Liberty Square section of the Magic Kingdom. This picture was taken back in March of 2006 in Hollywood Studios. I actually took this shot from the back of the seating area at the Lights, Motors, Action! stunt show. The plane is on display as part of the Backlot Tour at the park. It is a 1963 Gulfstream that was owned by Walt himself. This is the plane that was used to locate the land in central Florida that was to eventually become Walt Disney World. This event took place on November 22nd, 1963, and soon after Walt landed, he was informed that President John F. Kennedy had been assassinated. If you look closely, you will see that the tail number for the plane is 234MM. You probably guessed......the MM is for Mickey Mouse! This picture, taken on our September - 2009 trip, is from the Jungle Cruise in Adventureland. Originally, Walt Disney wanted to have live animals on this attraction. When it was decided that animals won't always act and "perform" (or even be awake) for the thousands of guests who ride every day, they went with very authentic and lifelike animatronics. However, Walt's dream of a Disney park featuring live animals finally came true in 1998 with the opening of Animal Kingdom. This picture was taken on our big family trip back in September of 2009. It was shot from a small balcony off of the second floor of the Grand Floridian lobby. You can see part of the resort's beach as well as the Polynesian Resort in the background. For those people who think that Disney World is just a bunch of rides and screaming kids, take a close look at this slice of paradise. Yes, the vacation kingdom can certainly be an exciting destination, but it is also a great place to take it slow and relax. Much of the information that we get regarding the Walt Disney World resort comes directly from the Disney company and their websites. Disney does a good job of providing basic information about the theme parks, resort hotels, restaurants, etc. However, to get more detailed and in depth information regarding specific aspects of the most visited vacation spot in the world, we turn to fan created "unofficial" sites. If you are considering a stay at one of the moderate resorts on property then you must check out PortOrleans.org. The Port Orleans resort has changed quite a bit over the years, specifically in the names of the different areas. Originally, there was Port Orleans, which opened in 1991 and Dixie Landings, which followed in 1992. In 2001, the two resorts were combined under the Port Orleans name. The original Port Orleans became "French Quarter" and Dixie Landings became "Riverside. Whatever you want to call this place, it is a wonderfully themed resort offering comfortable accommodations and a whole lot more. It will always be a favorite of mine, as my wife and I honeymooned at Dixie Landings back in 2000. PortOrleans.org was created by Andre Willey who is from England. It is one of the best fan websites I've come across since starting Digital Disney World. It looks very professional and contains an amazing amount of interesting and useful information. There are the expected sections that give details about each area of the resort including accommodations, restaurants, and recreation. However, PortOrleans.org doesn't stop there. You will also find up to date resort news, fun facts, and trivia along with a gigantic photo gallery containing over 2,000 pictures. In addition to the regular pics, there are some fantastic 360 degree panoramic shots of the grounds, lobby, and even a guest room. Of course Andre also includes several great videos from around the resort. Something that Disney is known for is creating a fictional "backstory" for just about every attraction, restaurant, and resort on property. When you are anywhere in Walt Disney World you are truly part of a show that is going on all around you. As you could imagine, Port Orleans has a very elaborate and detailed backstory that goes along with it. When it first opened, guests were issued a tabloid style newspaper with the name of either the Sassagoula Sentinal or the Sassagoula Times when they checked in at the resort. These handouts gave the full history (or backstory) of both Port Orleans and Dixie Landings. When the resorts were merged, a lot of the detailed history was watered down and the "newspapers" became more of an informational handout about current happenings. Thankfully, Andre includes the entire history and story on PortOrleans.org, including actual copies of some of the old handouts. Thanks to websites like this one, the interesting history and fun backstories of many areas of Walt Disney World are being preserved. In addition to all the great information and media to be found at Port Orleans.org, there is also a large forum section where visitors can ask questions and get involved in discussions related to Port Orleans. It is a great place to read trip reports from guests who recently stayed there. You can also contact Andre directly in this section of the site with questions and comments. As I said at the beginning of the article, if you are even considering a stay at this resort, you absolutely need to spend some time browsing through PortOrleans.org. Also, if you have stayed at Port Orleans or Dixie Landings in the past, you will certainly enjoy the pictures and stories that can be found here.